A place to find who's who in the world of the SDGs. The world has focused on an ambitious 17-goal agenda. We know “what” we need to do and by “when” we need to do it but “who” will carry out this transformative agenda? When the SDGs were launched BCCIC understood that while the goals were groundbreaking, the issues they championed were already being worked on by passionate organizations and individuals across Canada and around the world. Starting in our home province we began digitally mapping these agents of change and the SDG Movement Map was born. Seeking to find out how the SDG agenda resonated with civil society groups already implementing and advancing the goals, BCCIC held a series of 61 community roundtables across British Columbia to learn how the goals related to people’s work and could strengthen their impact. At a roundtable in Victoria the term “invisible mosaic” was used to describe the abundance of groups already working on the goals but whose efforts remained largely invisible to the public, politicians, and even many of the organizations themselves. In British Columbia alone this invisible mosaic included more than 2000 groups already advancing action on the SDGs. Roundtable participants consistently identified three strategic opportunities in the SDGs - To be a framework for collaboration, a lens to reveal the scope and scale of work taking place, and an opportunity to send a message and engage with political leaders on a local and national scale. With this in mind BCCIC developed the online digital Movement Map with the aim of enabling groups to connect with each other, providing features that allow the general public to localize the SDG’s while visualizing their political importance, and revealing the scale of the movement already advancing the goals. The British Columbia Council for International Cooperation (BCCIC) is a network that engages in sustainable development and social justice issues. We are a membership-based organization made up of individuals, international development organizations/practitioners, and civil society organizations in British Columbia. We promote and support the implementation of the United Nations Sustainable Development Goals, both locally and globally through public engagement, capacity building, networking, policy and representation, research, and youth engagement. 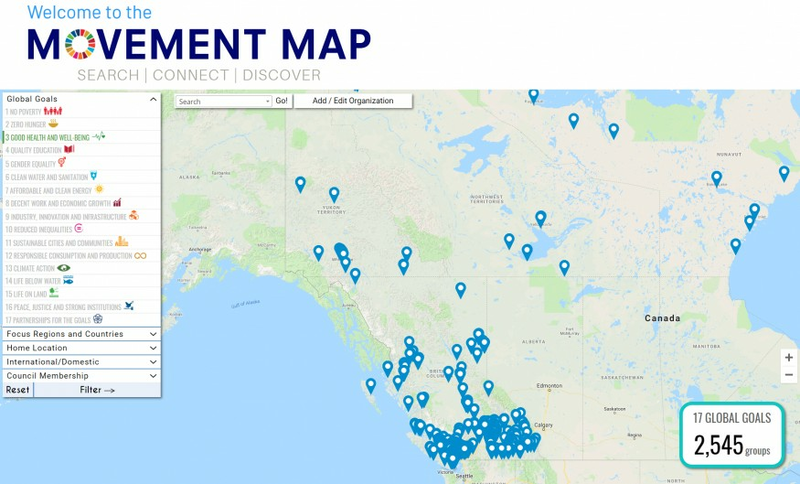 The Movement Map is a BCCIC project that has evolved from a small volunteer team into a team of ten staff + volunteers with an office in downtown Vancouver.